Home › Journal of Physics: Condensed Matter › How do electrons differ from holes in unconventional superconductors? How do electrons differ from holes in unconventional superconductors? In a recent Journal of Physics: Condensed Matter paper, Marcin Wysokiński and Jan Kaczmarczyk theoretically investigate the electron–hole asymmetry of d-wave superconductivity driven by the non-local effects of correlations in the generalized single-band Hubbard model. Read on to find out more in the authors’ own words. For correlated lattice systems described by the single-band Hubbard model, second-neighbor hopping is considered the most important source of electron-hole symmetry breaking on a bipartite lattice. However, this is not the whole story; such symmetry can also be broken in the interaction sector through the so-called charge-bond interaction – the off-diagonal element of the Coulomb potential. 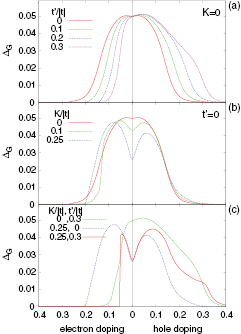 Dependence of the correlated gap on doping when the e–h symmetry is broken by: (a) only the next-to-nearest neighbor hopping term, t’; (b) only the charge-bond interaction term, K; and (c) both terms simultaneously. Taken from J. Phys. Cond. Mat. 29 085604, © IOP Publishing, 2017. All rights reserved. When the onsite Hubbard interaction is of the same order of the bare bandwidth, we expect this additional interaction to have amplitude, comparable or larger, than the second-neighbor hopping. By addressing the difference between emergent superconducting domes for hole- and electron-doped cuprates in our recent Journal of Physics: Condensed Matter paper, we investigate the influence of both terms on the unconventional, correlation-driven superconducting state in the Hubbard model. We discover that both terms are comparably important factors in breaking the electron-hole symmetry. In the future we aim to understand the effects of this frequently underestimated charge-bond interaction term in more complex systems. Marcin Wysokiński – He obtained his PhD in Theoretical Physics with highest honors at the Jagiellonian University, Poland in 2015. 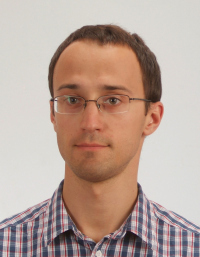 Since then within the “Mobility Plus” program supported by the Polish Ministry of Science and Higher Education he is conducting research in the field of strongly correlated systems as a postdoctoral fellow at the International School for Advanced Studies in Trieste, Italy. Jan Kaczmarczyk – He obtained his PhD in Theoretical Physics with highest honours at the Jagiellonian University, Poland in 2011. 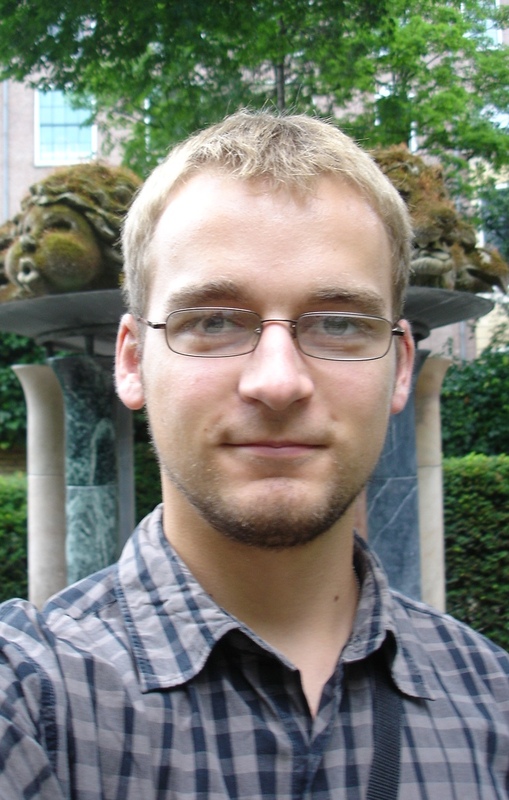 He worked from 2011-2014 as a postdoctoral research assistant at Jagiellonian University in the field of strongly correlated systems and from 2014-2016 as a postdoc at the Institute of Science and Technology, Austria in the field of atomic, molecular, and optical physics.